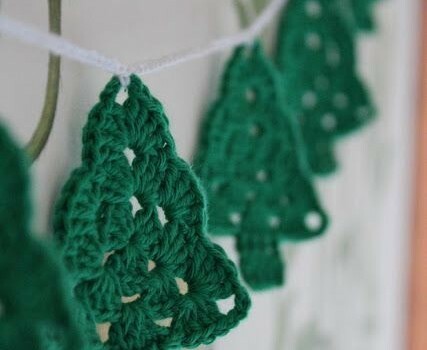 Homepage » Free Crochet Patterns » [Free Pattern] Grandma Tree Is Brilliant! 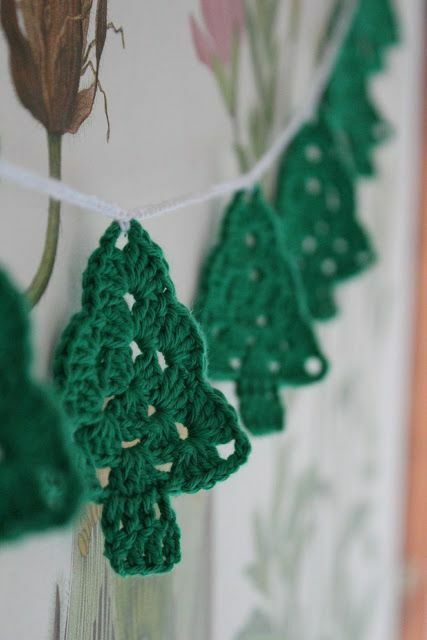 Love these crochet trees, they make nice garlands. A holiday bunting or maybe a cute ornament for the Christmas tree. This lovely tree can be, basically, hung anywhere or offered as gift. You can put them inside Christmas cards or use them as gift tags. Grandma Tree pattern by Michelle Kludas is a very easy pattern, even for beginners! You can finish a tree in a matter of a few minutes! These cute trees work up wonderfully, superfast and easily. Some say, they are as easy and addictive as a granny square! The pattern comes with a great photo tutorial with easy to follow instructions. Thanks to Michelle Kludas for this article inspiration and featured image. 63 Comments to [Free Pattern] Grandma Tree Is Brilliant! You can use them for a banner or attach to gifts. Took me about an hour an 15 minutes. A bit more difficult to crochet with size 10 thread. The green one is RH yarn. Thicker than usual. I tried put a brown trunk but I didn’t like the way it turn out. Not too good of change colors. I usually do a Christmas stocking mini . I also can do a wreath! In the stocking I put a mini candy cane!! Debi, the pattern is always linked to the name of the pattern. In this case, please click Grandma Tree words. Hope it helps! Here a pic of my little stockings!! I made these. Looks good with gold trim, sl stitch, ch 1 around. Jennifer Thomson Draper, is this what you were looking for? Love the patterns on this site. I just made this for my cousin! Baby’s first stocking and a little headband to match! Gould love this pattern, however all I get it ads….. The knitting is fine, but I think the trees need frosting. So how do you get the free pattern of the christmas tree???? Dianne, the pattern is always linked to the name of the pattern. In this case, please click Grandma Tree words. Hope it helps! I made several of these last year. Easy and cute. I’ve been making these for years…. I did click on the words in green and it came up as a dangerous site. Where is the pattern????? All I get is Choice Hotel advertisments!!!!!!!!!!!!! malware on this link for pattern!!!!!! and a virus!!!! !